Remove the seeds (I find them a tad too hot) and soak the chillies in water to tone down the brine flavour. Stuff them with whatever cheese you have – mozzarella, feta, cheddar, cream cheese or even a mixture. 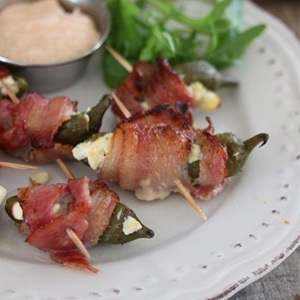 Wrap each stuffed chilli in a slice or two of streaky bacon and use a wet toothpick to secure. Pop onto a baking tray and roast for 15 -20 minutes. Serve with smoked paprika mayo.